Leaders of the Latino Leadership Council held a summit in Mexico City this past week where they met with local and federal officials. 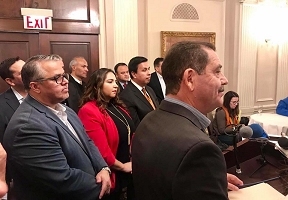 The group included Congressman Jesus “Chuy” Garcia, Illinois State Representative Aaron Ortiz, Chicago Alderman George Cardenas, and several other civic and business leaders. The LLC met with the Mexican Undersecretary of North American Relations and Mexico’s chief negotiator for the USMCA, Jesus Seade Kuri. “There has never been a more important time for our community to be united. The LLC is a powerful vehicle that will advocate for the betterment of our community and ensure us a seat at the table. Over 95 percent of all the political contributions to date by the LLC have been made to women. I am motivated and know that my generation and those after me will be the greatest beneficiaries of the work and power we will build in the next five years. We are prepared and ready to effectuate positive change,” said LLC member Tanya Patino. Members developed a five-year strategic plan for the organization. The strategic plan took into consideration key future events, such as the 2020 election cycle, 2020 census and the 2021 re-map. The plan includes a structure that lends itself to an aggressive membership recruitment effort with a strong emphasis on diversity of the group. “After an incredibly successful local election cycle for the LLC, we are motivated about the future. The LLC will work with strategic stakeholders to support voter registration and education efforts in the Latino Community. 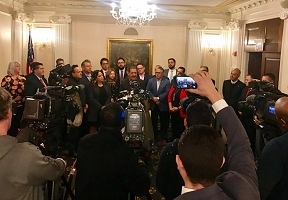 We will continue to financially support candidates with a good track record on Latino issues and inclusion. As the corner stone of our organization, we will continue to grow the culture of political giving in our community,” said LLC Chairman Juan Morado Jr.